Often 2 umbels together in an axil, each with 7-16 flowers. 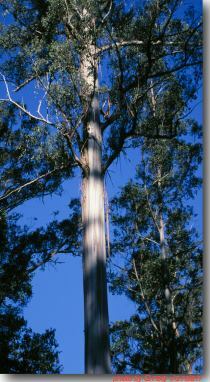 Tree with a shaft-like trunk which, in mature tees, is buttressed at the base. Found on well-drained sites with moderate ferility and high rainfall, usually in sheltered valleys in the south and central plateau but not on the west coast. Fast growing. The tallest known flowering plant in the world. An important source of timber marketed as 'Tasmanian Oak'; also used extensively as a raw material for newsprint pulp. Also suitable for firewood. Will not coppice after damage by fire or after felling. Not suitable below powerlines. 6-8 weeks to pricking out. Will germinate best after stratification at 3-5oC for 4 weeks. Although not as sucessful as stratification, treatment of seed with gibberallic acid or a 15 per cent solution of potassium nitrate for 48 hours can overcome the need for cold storage.